Despite increased education regarding its dangers, cigarette smoking remains a significant public health concern due to serious associated health consequences such as cancer and respiratory and cardiovascular diseases. Most smokers fail in their attempts to quit smoking, and current pharmacological interventions have relatively low levels of efficacy and are associated with significant adverse events. 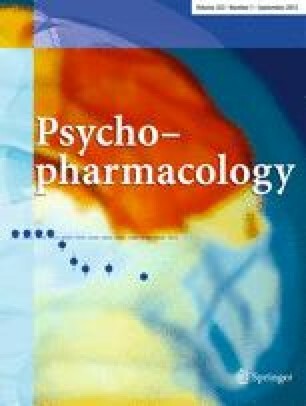 We have previously reported that combinations of metyrapone and oxazepam, administered at doses that were ineffective when delivered singly, resulted in dose-related decreases in cocaine self-administration in rats while not affecting food-maintained responding during the same sessions. The current study was designed to test the effects of the administration of a metyrapone:oxazepam combination on nicotine self-administration in rats. Several dose combinations of metyrapone (12.5, 25 or 50 mg/kg) and oxazepam (5 or 10 mg/kg) were tested in rats trained to intravenously (IV) self-administer nicotine (0.03 mg/kg/infusion) during 1-h self-administration sessions using both fixed-ratio and progressive-ratio (PR) schedules of reinforcement. The administration of low doses of metyrapone and oxazepam in combination significantly decreased IV nicotine self-administration in rats. At the lowest doses of 12.5 mg/kg of metyrapone and 5 mg/kg of oxazepam, the drugs alone did not decrease IV nicotine self-administration, but the combination was effective. Varenicline was also tested using the fixed-ratio schedule, and reductions in nicotine intake were similar to those seen with the moderate dose of the combination. The results of this study suggest a potential utility of the combination of metyrapone and oxazepam for smoking cessation in humans. Part of this work was funded through a contract awarded to Behavioral Pharma, Inc. from Embera NeuroTherapeutics, Inc. and was conducted by Dr. Azar at Behavioral Pharma, Inc. in La Jolla, CA. Part of this research was also conducted at The Scripps Research Institute in La Jolla, CA and was supported, in part, by the Tobacco-Related Disease Research Program (TRDRP) from the State of California (grant 17RT-0095), the Pearson Center for Alcoholism and Addiction Research and the National Institute on Drug Abuse (DA023597). This is publication number 20890 from The Scripps Research Institute. All authors were involved in the design of the study and interpretation of the results, and the drafting and review of the manuscript, and all authors approved the final version. Dr. Goeders drafted the first version. Dr. Goeders is the Chief Scientific Officer and a founder of Embera NeuroTherapeutics. Drs. Goeders, Fox and Koob are consultants for Embera NeuroTherapeutics. Dr. Koob is a consultant for Behavioral Pharma.